In the U.S., we tend to have a limited view of what to expect when we ask for a grilled cheese sandwich. If it's served in a restaurant or diner, we expect soft bread that's been well buttered on all sides and toasted on a flat top grill. The filling is usually American cheese and it's not uncommon to ask for a tomato slice to be included. Sans tomato slice, we tend to like it as an accompaniment to a bowl of hot tomato soup. If we're making it at home, we're likely to make it on the stove top in a large pan, possibly cast iron. Other options include a toaster oven or regular oven. In the United Kingdom, the cheese is far more likely to be cheddar and you'd be ordering a cheese toast or toastie. And in both places, this treat is likely to be served at lunch with either soup or a salad. Our version of grilled cheese likely dates back to the 1920s, during the depression, because it was an inexpensive meal. But heated cheese and bread is hardly a modern or western idea. It's appeared in many cultures and in many forms since ancient times. In recent years, the old-fashioned grilled cheese has gotten a modern makeover and lots of different varieties have popped up in restaurants and specialty food trucks. A greater variety of breads and cheeses and lots more additions to the sandwich are now commonplace. Middle Eastern cuisine uses a lot of feta cheese in general and, while it's not a very good melting cheese, it's easy to turn it into a cream that goes beautifully inside a grilled pita pocket. Tomatoes are commonly used so it makes sense to add them and the wilted spinach provides a wonderful flavor along with a touch of za'atar or oregano. Definitely a different and delicious lunch option. Add the feta cheese and milk (or cream) to a food processor or blender and process until smooth. 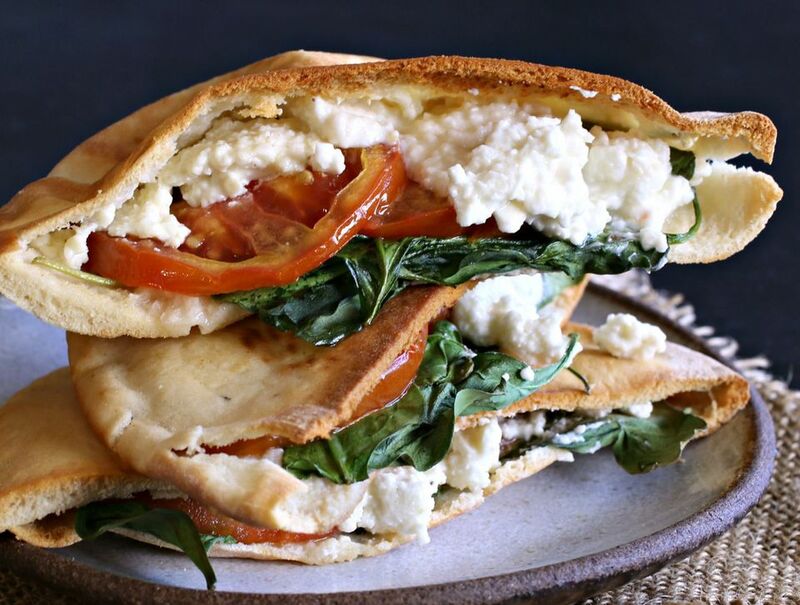 Spread an equal amount of the feta cream into each of the 4 pita pockets. Slice the tomatoes thinly and insert 2 or 3 slices into each pita pocket. Stuff each pocket with an equal amount of the spinach leaves and sprinkle on the za'atar or dried oregano. Place all the pita halves on a baking sheet lined with parchment paper and brush the tops with the olive oil. You can also use oil in a mister and spray it on. Bake in the oven for 10 to 15 minutes or until the spinach has wilted and the pita has turned a light golden brown.